Sorry counter-terrorists, but the hostages are in another castle. The cluttered hallways of cs_office have been familiar territory to PC gamers since the classic map first appeared in Counter-Strike. However, if you boot up Counter-Strike: Global Offensive and connect to the 24/7 cs_office server hosted by Reflex Gamers, you'll notice something out of place: an unassuming video game console, hooked up to a TV in the projector room. If you don't mind straining your ears to listen past the background gunfire and your teammates' cries for help, you can even play an amusing recreation of a classic Mario platformer. Just don't be surprised if the hostages slip away while you're busy collecting coins. Pray and Spray, the coder responsible for the server plug-in, made sure to include all the realism that Counter-Strike veterans have come to expect from their games. Once the map loads, you'll need to insert the game cartridge into the console (which is dubbed the SourceMod Entertainment System, or SMES), turn the system on, and then grab a controller to play. You can even bring a friend to play co-op, potentially leading to some endearing cross-team cooperation. Once the virtual game loads, you'll be able to try your hand at playing Super Mareo Bruhs, which is a totally unique IP and not at all related to that other franchise. The level of detail is impressive: the 8-bit game is as simple as you'd expect, so it's easy to overlook the corded controllers, which include buttons that depress in response to your input. Players who are out of the action can respawn as "ghosts" (another feature of the server), and as an added touch, ghosts can grab a controller and stomp some not-goombas while waiting for the next round to start. You can check out Super Mareo Bruhs for yourself at the Reflex Gamers server, conveniently located at 74.201.57.168. 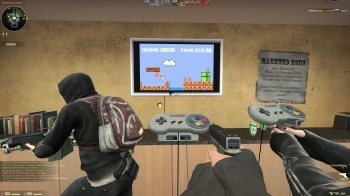 Now, the race is on for a Super Mario Brothers mod that lets you join Counter-Strike servers.